The letter comes from a group calling itself the “Dartmouth Community Against Gender Harassment and Sexual Violence” and urges that members of the College’s leadership “acknowledge their glaring breach of responsibility, issue a public apology, and begin a transparent overhaul of regressive practices.” Addressed to College President Phil Hanlon and the Board of Trustees, the letter was originally delivered with over 500 signatures on Dec. 6. The letter is intended as an “initial statement,” according to Jennifer Ditano, one of the letter’s co-authors and a current graduate student in experimental and molecular medicine. “We wanted to be able to put forth an initial statement while there is focus on this issue, while the school’s attention is drawn, so that we can say we’re here, we have these voices, we have these concerns, and we expect that the College will acknowledge them and work with us to take action,” Ditano said. She noted that there was collaboration among undergraduate students, graduate students and alumni who helped write the letter together. “I found it a really energizing and empowering process to work collaboratively, and this is a multi-generational group, which is great,” Diana Whitney ’95, one of the letter organizers, said. Lorelei Yang ’15 said that the presence of single-gender social groups at the College — such as Greek houses — is a contributing factor to sexual misconduct on campus. She added that she believes women are not in enough places of authority, especially in positions responsible for responding to allegations of sexual misconduct. Charles Fenn ’22 said he signed the letter in order to be a positive influence on other male students. “Especially in sports or fraternity culture, which are cultures I’ll probably immerse myself in, I can be one to educate or at least give an idea to guys of when to stop, or what is correct and what is incorrect,” Fenn said. Visiting history professor Erika Monahan ’96, who also signed the letter, said that “some really bad tenure decisions were made” at the College. Robbin Derry ’75 wrote in an email statement that at a university where she used to teach, she reported “an ongoing situation of sexual harassment” of several graduate students that eventually led to her departure from the school because the administration was reluctant to dismiss the accused professor, who brought in grants and was friends with the chancellor. “I know what it is like to stand up and speak out, and to realize how few people are willing to visibly stand with you,” Derry wrote. Jennie Harlan ’20, a sexual assault survivor who has been through the Title IX process herself, expressed sympathy for the plaintiffs. “I know how incredibly frustrating it can be and how draining it can be,” Harlan said. The letter states that a more detailed list of demands from the signees will be published in January. Harlan emphasized that she wants to see more accountability from the College. “I feel like … the go-to is just making a committee to try to solve something or at least have a conversation about it, but nothing concrete is actually being done,” she said. “There’s a lot of work to be done,” she said. 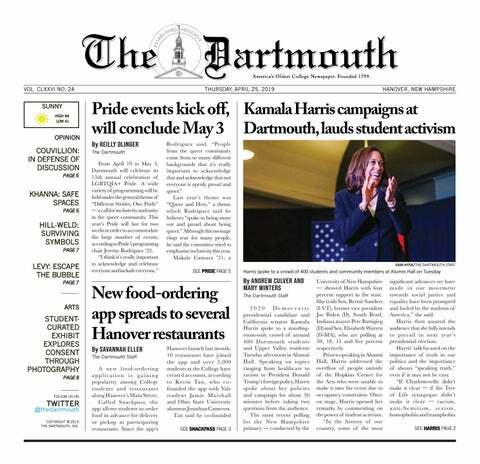 On Dec. 12, Hanlon sent a community-wide email stating that in January, Dartmouth will announce a “sweeping plan” to combat sexual assault on campus, citing steps already taken in the 2015 Moving Dartmouth Forward campaign and the 2016 Inclusive Excellence campaign. “We unequivocally share the goal of the women who brought the lawsuit that we must pursue ‘meaningful reforms that will permit women to engage in rigorous scientific study without fear of being sexually harassed and sexually assaulted,’” Hanlon wrote. Yang is a former opinion editor for The Dartmouth. Correction appended (Dec. 18, 2018): The title of this article has been updated to reflect that the letter of support was signed by nearly 800 individuals.